Vintage finds and retro handmade--a sweet mix I know you'll love. This is my blog. To visit my stores, click the Etsy or Artfire links above, or the product images on the right column of the screen. Today, I saw a Scissortail Flycatcher fluttering overhead as I sat waiting for the light to change in the intersection. It's one of those friendlier harbingers of spring here in central Oklahoma (the unfriendly one being severe weather and tornadoes). It's hard to believe it's that time of year already! There are other reminders of spring around here, including my flowering plum tree, which looked like a giant ball of pink flowers until about a week ago. It was the model for my hand-embroidered wall art. The sun is already shining brighter than it was before, but the air is still cool and crisp, especially on a rainy day like today. It's sort of like the colors in this scarf. Can you feel that breath of fresh air just looking at this picture? However, when the sun does come out, it seems like the whole world is adorned in shades of white, yellow, and green. Sort of like this cheery 70s Mod plaque! As for me, I've been spring cleaning around my house these past two months, and it feels so much better! I don't know how I have managed to accumulate so much clutter, but I certainly have. It can catch up with you and overwhelm you. I'm working on being a little more "house proud." The first step has been to declutter. I have gotten rid of tons of paper I don't need any more (magazines from years ago, old records that I needed to shred, and clippings I just don't need to save). In the process, I found that a lot of what I have lying around is connected to negative or stress-inducing memories. I'm clearing that out, too. It's almost like an emotional spring cleaning! I didn't expect the feeling of freedom to be so instantaneous. If you feel your house pressing in around you, maybe you should try it. The second step, coming soon, will be to update my furnishings and surroundings. It feels so good to dream! It must be spring. I've been gone a lot these past few weekends, mostly for work, but this weekend I traveled across my home state with friends to see the Honey Creek battlefield, the site of a major Civil War conflict that decided my home state's position as a Union-held territory in the war. Most of the photos I took of the place are the "you had to be there" kind, but I had one I thought I'd share. 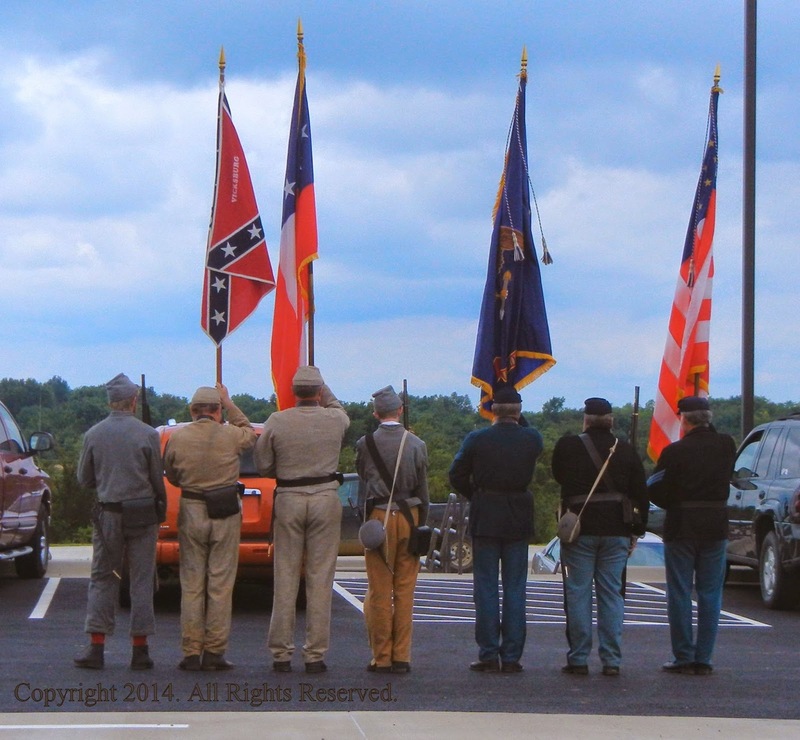 This was a group of Civil War reenactors who fired a cannon and marched around us into the parking lot at the dedication ceremony for the museum that is being built. I failed to get a picture of the cannon going off, but it is an experience you should have at least once in your life. The important take-away from that place is a tangible connection to the past. I walked where soldiers stood 151 years ago and I saw where the battle lines were once drawn. It is a part of this world that we shouldn't forget. That's what vintage collecting is all about---keeping a connection to the past. Everything I have curated in my stores is a connection like that. I don't have anything from the era of the Civil War (I imagine artifacts like that rarely end up in estate sales, anyway), but I have a couple that are much older than the rest. This rose gold stamped brooch actually did come to me from an estate sale. I picked it out because the pin back just looked old to me and the color was unusual. 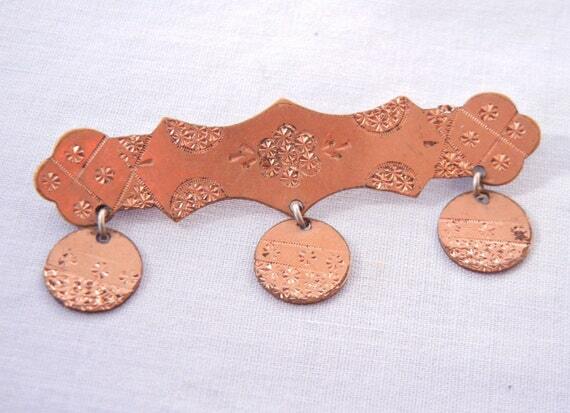 After consulting with some vintage jewelry experts, I now know it dates to approximately the 1880s or 1890s. I sometimes find myself wondering what dress this pin once accessorized. This miniature dry sink may also date to the very late 1800s, but I've conservatively dated it to the 1910s or 1920s. It hearkens back to the time when there was no indoor running water and all "washing up" had to be done in a washbasin with water that had been brought indoors. Of course, this is the tiny version of a normal American dry sink. It either served as a salesman's sample or as a "mommy and me" child's toy. Do you have something in your home or family that connects you to the distant past? I'd love to hear about it in the comments. For the past month I've been working on a major reorganization of my stores, my store room, and even my personal bookshelves. It's been such a huge project that I haven't been able to post about the major holidays over the past few weeks. I really hope if you haven't finished your gift purchasing (say, for Father's Day or a birthday) that you'll pay me a visit with enough time to allow for shipping! It has occurred to me that the "visual clutter" I have recently removed from my stores may have been keeping you from seeing some of the great things I have. I thought I'd pop in today and show you some of the things you might have forgotten about, and tell you their stories. A few years ago, I used my printmaking knowledge to carve and hand-print two designs of bookmarks. The first one is the first part of a Victor Hugo quotation I happen to like: "To learn to read is to light a fire; every syllable that is spelled out is a spark." It was a way of uniting my two loves--writing (and by extension, reading), and fine art. I invented my own smoke and flames inspired script for this bookmark. My other bookmark design depicts a type of grass in an Art Nouveau style. I found a lovely tile motif in an old book on the New York Museum of Art website and decided to copy the lines of it. It was almost too delicate to cut out! These two bookmarks share the same plate, incidentally, and have to be cut apart after I ink them and apply the paper in the Japanese style. I printed them in four color/paper combinations (three of which I still have). Unfortunately, there are few people in the world who appreciate a handmade bookmark when commercial ones are so easy to come by. If you are interested in something really special, they are all in the "Books and Bookmarks" section of my Artfire store. Speaking of printmaking, I made this aquatic themed print in college. Yes, it does reflect my early interest in Art Nouveau and jellyfish. This was made using a technique called Monotype, which involved painting ink on smooth plates, removing layers of ink with tools, inking the plate again to layer the colors, drawing with colored pencil, etc. It can only be printed once per composition, unlike the bookmarks above, so whoever comes to own this one, called "The Reef After Dark," will have an exclusive piece of art. Here is another early handmade item from my stores. I have a Japanese flowering plum in my front yard, and I think it's gorgeous in the spring. 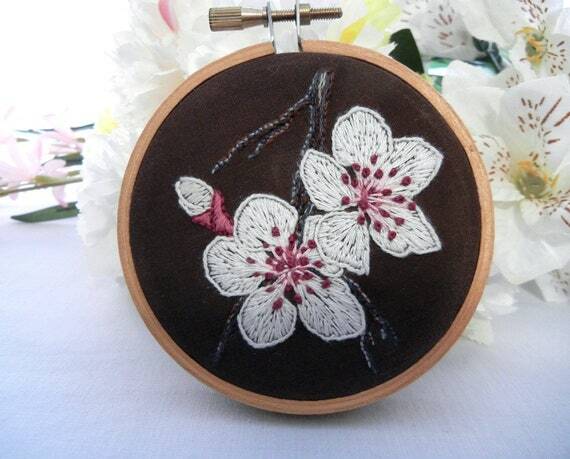 I decided to draw and hand-stitch a cluster of flowers on the end of a branch, using satin stitches, back stitching, French knots, and more. It took forever! If you like this one-of-a-kind piece, you can buy it here. 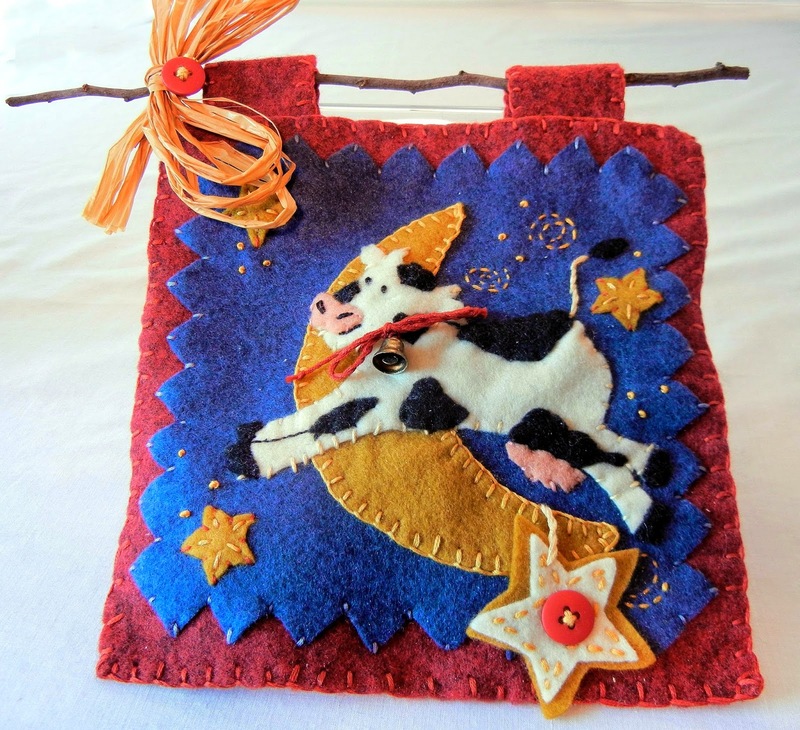 I also have recently moved this little piece of rustic-style felt art to Ebay. It is all hand-stitched and dates to my junior high days. I was using a pattern, but I must say my success with it may be an origin for my pom pom animal line, which you may be very familiar with. Yesterday, I posted on my Facebook fanpage about a decoupage project I made with friends over the weekend, just to get out of a crafting rut. I used a cardboard box I had purchased nearly a decade before to decorate, and layered on magazine clippings about Hawaii, circulated stamps from Micronesia, and a few vintage crate label prints from an old calendar. I'm not really serious about opening a decoupage line of products in my store (unless you ask, lol) but I plan to post a picture of my project over there if you'd like to stop by and leave a comment. I am considering drawing some iron-on embroidery transfers and selling them as kits, because doing it myself would require me to charge pretty high prices for my time. Would any of my readers be interested? What sort of things do you like to craft? Let me know in the comments. There are spring flowers and new leaves are gleaming in the bright sunshine around here. It makes me want to wear and decorate with bright colors, and throw open the windows to let in the sunshine. Mother's Day in the US is right around the corner, it's the peak of wedding season, and it's May birthday season, too. It's easy to find a good excuse to break out the flowers! 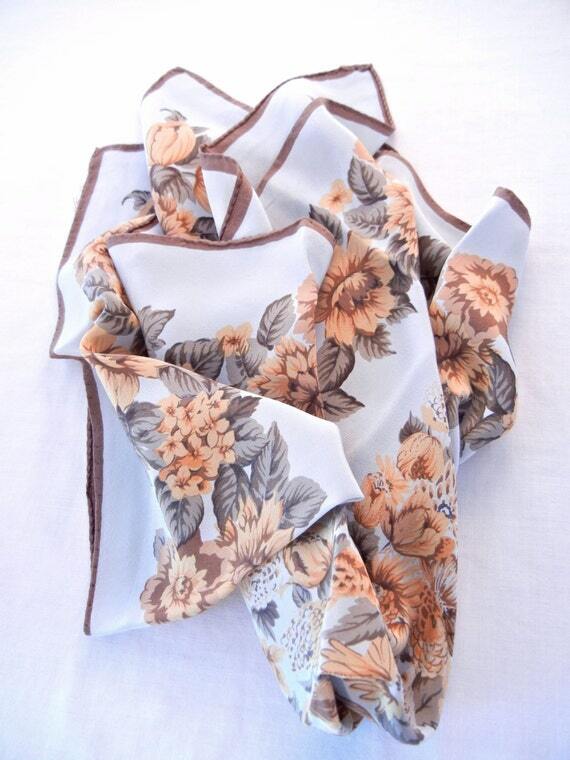 This vintage Vera Neumann scarf is fabulous! It is from the late 60s, and has never been worn (it still has the store tag on it). 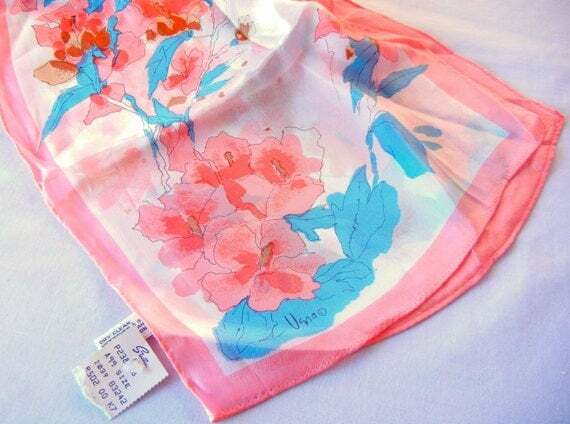 The print looks like peach pink and red Azaeleas with turquoise leaves. 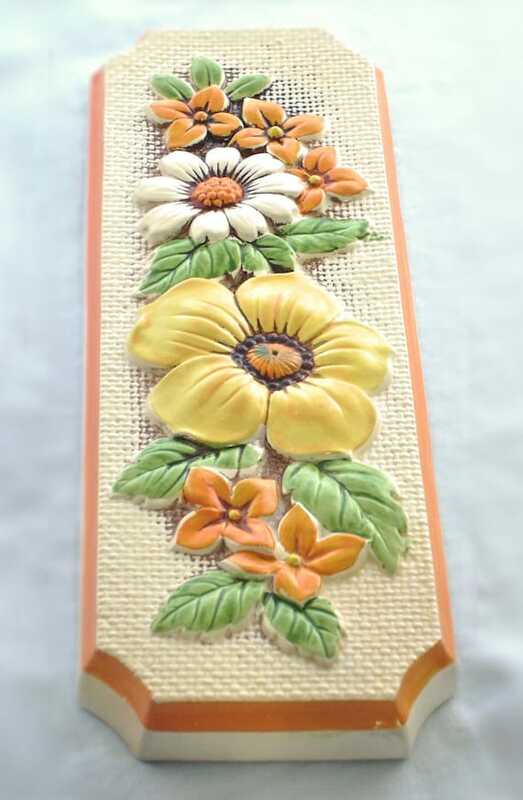 This 70s era ceramic citrus floral wall plaque is the perfect way to brighten up a narrow strip of wall, perhaps in a kitchen. It has a hanger already attached to the back. I believe if this is not Lefton, it is a quality imitator. This silk scarf has a more neutral color palette, but that light blue still feels like spring to me--in the winter, it seems like the sky is always gray. 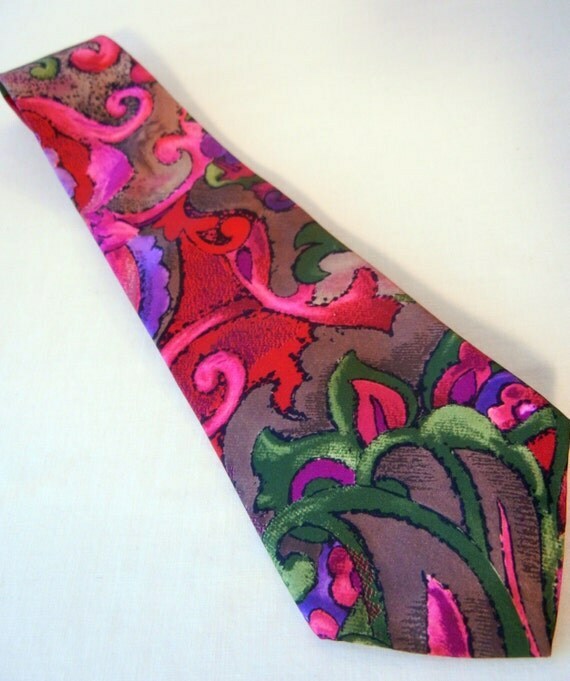 This men's Hardy Amies necktie has bright colors that remind me of flowers, but the pattern still has a masculine edge to it. A daring man could totally pull this off with a gray suit and a coordinating shirt. 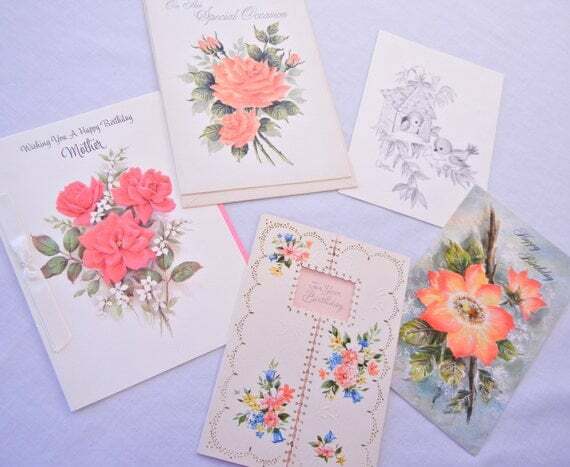 This selection of 50s-70s era birthday cards will help you get prepared for Mom's birthday this year. Some of them can be used for other people's birthdays, as well. They don't all mention mother in the messages on them, and only one has some writing on it. I am only scratching the surface of what I have in stock. Floral themes are eternally popular and I don't think they ever go out of style. Many flowers also carry a special symbolic meaning (rooted in Victorian and ancient traditions), which makes them great gifts. Hope you'll stop by! Adorable indeed! These are precious! Love these. I can only wear clips or screwbacks due to an allergy. I'm so pleased. Will look again. fast shipping, great communication - recommended! I loved the bookmark. It is beautiful. I would definitely recommend it to others. Such a great concept and very well executed! Thank you! Can't believe you had this for sale! 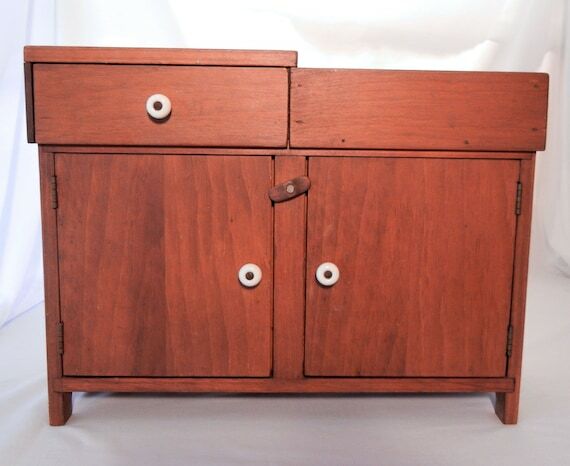 The same one is sitting in my kitchen; it was my grandma's. I'm taking this one when I move out! Incredible, Beautiful, Great Deal!, this baby will be treasured. Thanks so much! These are crazy cute. Just adorable. Arrived quickly and well packaged too. Thanks! Received this jewelry box yesterday. It is beautiful and exactly as described. Thanks!! A really beautifully crafted and designed ornament. Lots of character. Lovingly made and packaged. Great service. Fast shipping, love this poodle ornament! I received my poodle yesterday and totally loving her!! Hope you will have lovely day. Very cute and unique. Thank you so much!! Absolutely adorable [ornament]! Even cuter than pictured! Thanks so much! These are absolutely adorable! The pictures don't do them justice as in person they are even more adorable if that is possible! These are for a gift but my goodness was I tempted to keep them! Super crafter and really friendly and helpful!! A credit to Etsy!!! Just as pictured! Thank you for wonderful fast service. Cute item! Super quick shipping! I just received them in the mail just in time for Christmas. They look a little zanny but I love that they are black standard poodles and remind me of some ornaments we had in the 70s on the tree when I was growing up. They were animals that looked like they were made from pipe cleaners just like these ones. Absolutely adorable, very fast shipping!! So cute...fast shipping too, thanks! We love the poodles! And we received them very quickly, packed well and in great condition. Very happy with this seller. adorable items, fast ship, many thanks! nicely made and accommodating, thank you! Soo cute, and well made. Thanks. I had this on my Favorites list for sooooooooo long. Glad its finally on my wall! Item as described, great price, fast shipping. Thank you! What a beautiful little scarf I received. It's so much prettier in person and I'm excited to wear it. It was just as described and arrived in a timely manner. Text and Images Copyright 2010-2012 Rachel Miller. All Rights Reserved. Watermark theme. Theme images by johnwoodcock. Powered by Blogger.